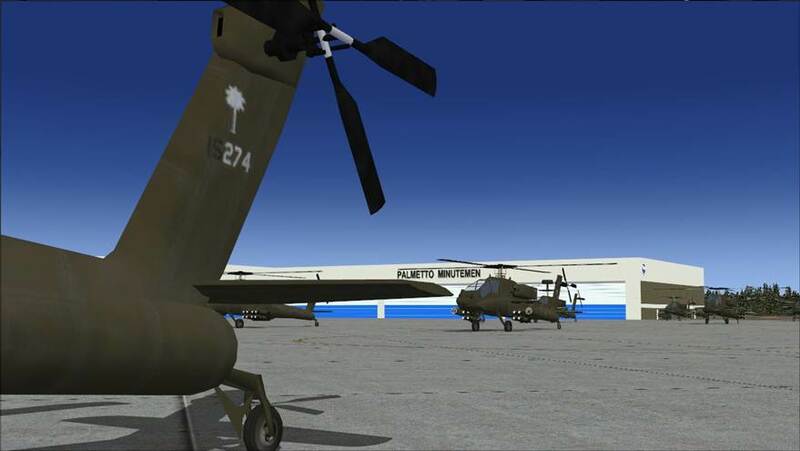 This freeware AI package, produced by Military AI Works, brings to McEntire JNGB (Joint National Guard Base) in FS2004. Located outside the small town of Eastover in South Carolina, McEntire is a lesser known but important air base that hosts both South Carolina Air National Guard and South Carolina Army National Guard aviation units. This package depicts three of the units based currently based there, the 169th Fighter Wing which operates F-16C/D and C-130H aircraft, the 1-151st Attack Reconnaissance Battalion which flies the AH-64D and Detachment 1 B. Company of the 2/238 Aviation Regiment which flies the CH-47D. This package contains flightplans, callsigns and afcads depicting each unit. NOTE: The 169th FW was previously depicted in the “Southeast ANG” package from a few years back. If you have this package installed please replace your older “MAIW_HTAI_F-16C_SEANG” and “MAIW_HTAI_F-16D_SEANG” with the ones included in the optional files folder, this will give you the most up to date flights and schemes. NOTE: Failure to remove these duplicate files may result in problems with AI aircraft parking and operation. It is recommended you move these to a temporary folder instead of deleting them; however, you should not need them again as the AFDs included in this package are thoroughly researched and highly detailed. If you are using add-on scenery for one of the above airfields, it is recommended you do NOT remove the AFD for the add-on scenery, but instead remove the MAIW AFD file (e.g. MAIW_XXXX_DEFAULT.bgl) after installation. Included in this package is a excellent freeware scenery for McEntire JNGB by John Stinstrom. These sceneries will be automatically placed into the correct directory for installation when you install this package. 1) The folders “MAIW McEntire JNGB (KMMT)”, “MAIW Scenery Library Objects” and “MAIW Land Class” have already been installed into the “Addon Scenery” folder of your FS directory. In order to activate this scenery you must start FS9, go to Settings and find the Scenery Library. 2) Click on “ADD AREA” and navigate to the “MAIW McEntire JNGB (KMMT)”, “MAIW Scenery Library Objects” and “MAIW Land Class” folders which should be, by default after installation, located in “Flight Simulator 9\Addon Scenery”. ***Note it is important that you place the “MAIW Land Class” folder and “MAIW Scenery Library Objects” folder as far down your addon scenery list as possible by using the Move Down button. Ideally they should be lower than any other scenery you may have added and just above the default FS9 scenery libraries. The “MAIW Land Class” folder should be below the “MAIW Scenery Library Objects” folder. This will assure that you do not have any missing scenery or land class. All flightplans were created using RPP_FPGen. All AF2 files were created using Lee Swordy’s AFCAD v2.21.